Instead of telling me to post in a different thread (i.e. engaging in ad hominem attacks) maybe you could rebut with facts? Maybe it's me, but I'm not seeing an ad hominem attack in oren's post. New Delhi: The Himalayas, the world’s highest mountains, are getting warmer, according to a study published in science journal Current Science. “Total precipitation (rainfall + snowfall) was found to increase whereas snowfall was found to decrease with concurrent significant increase in rainfall at all zones of NWH,” the study said. It warned that rising trends in liquid precipitation have a negative influence on Himalayan glaciers and “frequency of hazards such as avalanches and landslides is expected to increase during late winter”. The study analysed wintertime variability in climatic parameters like temperature (maximum, minimum and mean) and precipitation over Northwestern Himalaya (NWH) along with its constituents — Lower Himalaya (LH), Greater Himalaya (GH) and Karakoram Himalaya (KH) — during three time scales 1991–2015 (25 years), 1991–2000 (10 years) and 2001–2015 (15 years). It was done by H.S. Negi, Neha Kanda, M.S. Shekhar and A.Ganju of the central government’s Snow and Avalanche Study Establishment, Chandigarh. It said the “impact of global warming is evident over NWH in form of rising maximum and mean temperature at all zones and NWH”. “An overall warming signature was observed over NWH since maximum, minimum and mean temperatures followed rising trends with a total increase of 0.9 degrees Celsius, 0.19 degrees Celsius and 0.65 degrees Celsius respectively, in 25 years, the increase being statistically significant for maximum and mean temperatures. However, warming was not consistent over all zones of NWH,” said the study published this week. “Interestingly, snowfall amount is found to have decreased whereas rainfall amount have increased in 25 years. Furthermore, precipitation at all zones except LH follows decreasing trends in last 15 years (2001–2015) which signals significant climatic change especially after year 2000,” it added. This is significant as changes in snow and ice cover affect air temperature, sea level and storm patterns. “The increase in liquid precipitation during winter months over seasonal snow has induced enhanced melting and flood situation in Kashmir recently (5–7 April 2017). Such rising trends in liquid precipitation over snowfall, have a negative influence on the Himalayan glaciers. In addition, the frequency of hazards like avalanches and landslides is expected to increase during late winter,” it warned. They both show Snow Water Mass (Equivalent) still going up like a train. But the first says about 3,900 GT (Km3) and the second about 3,300 GT. The second excludes mountains - does the first? Or is it different methodology? Figure 3: These plots present time series (updated daily) of the current amount of water stored by the seasonal snowpack (cubic km) over (a) Northern Hemisphere land areas (excluding Greenland), (b) North America, and (c) Eurasia. Snow depth from the CMC analysis is converted to snow water equivalent using a density climatology obtained from snow survey data. The time series average and range between ±1 standard deviation (calculated for 1998/99 to 2011/12) shows how current conditions compare to historical variability. I believe the first is mountain-inclusive; the Canadians are much more progressive than the Finns in this regard. Signs of maximum soon ? I wonder. It seems like North America should continue a sharp increase over the next week. Eurasia should also see substantial snowfall. The gains over North America will largely be over the mid-latitudes. There seems to be a worsening battle between the expanding annual ice sheet & the warmest-ever SSTs over the NW NATL. It seems as though the Gulf Stream has drifted very far north and has now subsumed the Gulf of Maine entirely. This seems to have caused a rather abrupt instance of sea level rise across the NE seaboard. Montauk has been +2 to +3 feet above normal for days! The warmth extends the length of the seaboard, as do the high readings relative to normal. Judging by the linked maps, it seems this is to be blamed on a very dramatic warming and northern push by the Gulf Stream? It looks like a wall of oceanic heat is backing up into the NE US/NW NATL and shows no signs of slowing down. Probably partly to blame on the record +500MB February heights over the region. We should see another major winter storm on Wednesday, and another possibility by D5-6 means that the NE/Quebec should only be adding to current anomalous mass over the foreseeable future. I think we could max at over 4,500KM^3 across the entire NHEM, and North America could crack 1,500KM^3 on its own. Something I have also thought about and that some might consider a variable worth studying is Hawaiian snowfall impact on hemispheric patterns. Mauna Loa and Mauna Kea have fairly limited areas but the wintertime contrast between sun angle there with Alaska is simply enormous, in fact, they receive about 30X as much solar radiation. It is feasible to consider that dumping of cold out of Bering and into the NW Pacific/Rockies could indirectly ultimately impact Hawaii, increasing snowfall (potentially). Though limited in relative scope, even with a reduced snow line, in December, 200KM^2 of cover on Mauna Kea and Mauna Loa has the equivalent effect of 6000KM^2 of cover over Alaska! We currently have about 150KM^2 FWIW. In any case, this must have some substantial impact on weather, as well as the subsequent snowmelt. Hawaiian snow droughts + snowstorms could have increasing importance as weather weirding results in increasingly anomalous airmasses reaching the islands and while they don't look like much, in a season like winter, their impact is very outsized. In any case, forecast calls for more snow! isn't that high tide just caused by the winds? Last week i read in the Dutch news that they closed some of the storm-gates to prevent too much water getting blown away. Water lvl's were lowest in 30 years for the Rotterdam-area. Rutgers Univ. NH Snow Cover extent figure for Feb 2018 is 46.29 million sqr km. That is 0.7 million above the 1981-2010 average. It's a little up on the previous two years. isn't that high tide just caused by the winds? Regarding the NH snow water equivalent chart from Environment Canada, does anyone know if it's possible to view some kind of map of the anomaly? Meaning - where is all that snow to be found? The NH is a big place. 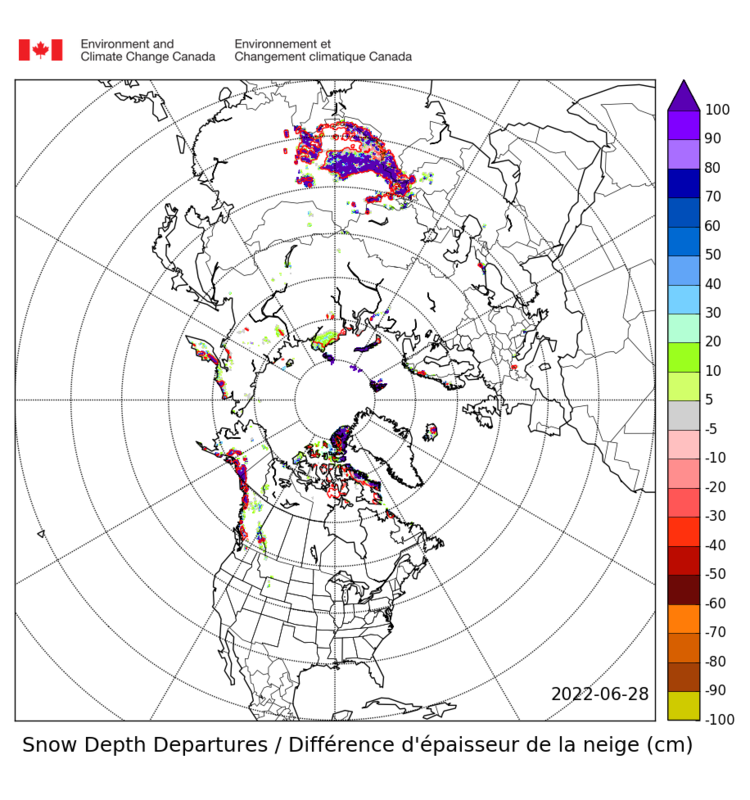 Environment Canada ( https://www.ccin.ca/ccw/snow/current ) has a snow depth departures map. But i expect you have looked at that already. Gives one a clue. Thanks, I somehow missed that. Will bookmark. I want to do some little pet project. Also, Climate Reanalyzer sea ice/snow cover tab. It doesn't have depth information but the periphery is easier to inspect in their projection. Does anyone know where we can find a table of daily Northern Hemisphere snow cover ? The best I could find is Rutgers, but even though they publish daily maps, their table is updated only once per month. I think the Climate Reanalyzer data is very wrong as the GFS has a very poor snow initialization scheme (which it is based on). At least it is far inferior to the Canadian's (IMO), which makes sense given how much more important snowcover is perceived to Canadian vs. US weather (though reality is... it is equally important for both!!!). The Canadian map animated (at link) gives the best visualization of the yearly annual snowpack's growth. This year, we have broken the old graph's limits, and are now cranking past 1,500KM^3 of SWE across North America. The lion's share of the anomaly is over Quebec, though splotches of high cover are present over almost all of the continent over 45N. I suspect that the melting of this enormous mass of snow and ice will be quite a taxing event on the already out of whack circulation in the North Atlantic. With so much heat in the NW NATL, summertime impacts on Greenland are also (IMO) likely, which means we may be dealing with an anomalously large melt across several regions adding a much more substantive injection of freshwater than any previous year. Thanks Archimid, I'm actually interested at the moment in snow depth rather than snow cover. 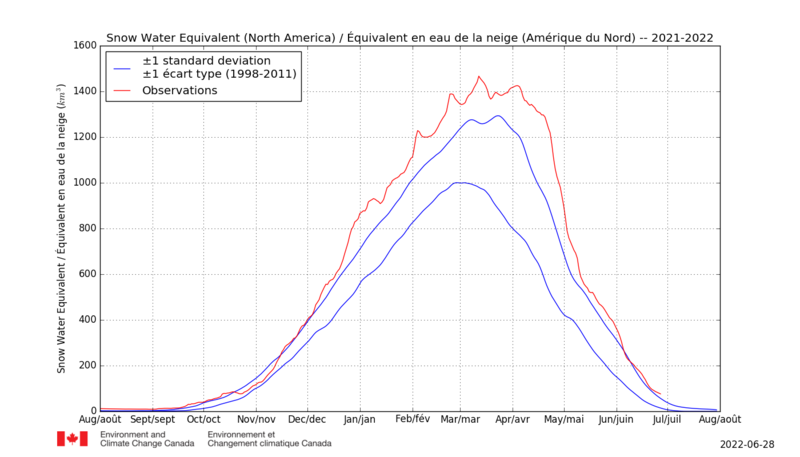 North American snow-water-equivalent must be at a record, at a current figure of about 1,550KM^3. Over the next week+, this should rise substantially further, as additional major falls should continue over the Rockies, and as SE Quebec is buried further. There will be significant snowfall further south as well and while this will be transient, if sustained for a week or three, perhaps we see a maximum over 1,700KM^3? Is that map saying snow depth of 2-4 inches in Chicago on 3/10? We haven't had any real snow on the ground here for 2 weeks. Thanks Niall. That is useful. I could have sworn that last year they were updating that weekly table also only once a month. But this year they already posted week 9, which suggests a weekly update. Let's keep an eye on that table and see if next week they post week 10. We will lose the battle to the sun within another few weeks, but this March may be rather extraordinary for both its continental cold and snow. In fact, if the 00z EURO is right, there will be *sustained* gains across most all regions, with losses confined to vicinity of Kazakhstan -- even immediately to the north of there, Russia's snowpack will be gaining substantial bulk. The question we have to ask moving forward is how deep it has to get & how cold it has to stay in Quebec & NE Siberia for cover to last all year... and I think we are very close. Just how deep does it have to get. The surface will be at zero C. If you don't get 100% melt out each year you get a new ice sheet. The reason for the first question is that it is difficult (at least for me) to get the data behind the maps and snow water equivalent charts, and that in trying to get specific weather station data to substantiate the SWE chart and the snow depth and anomaly map, I had some challenges. The reason for the second question is the lively discussion on the forum of what the SWE anomaly actually means. I finally managed to generate a snow depth database for the past 19 seasons (2000-2018) for a single station that lies inside the anomalous area in Quebec - Goose bay (yes, in Labrador actually). I used Ogimet Synop data - the only side where I could get historical snow depth measurements. I didn't use this link but actually used multiple queries to get the raw synop reports, parsed them, and then trimmed then to cut off late snow days after the winter pack has melted out, and days that only had snow patches remaining. Had to use some judgement and spent ages getting it sorted out. Note: Goose Bay is the only station in the Ogimet database that is inside the high snow area in Quebec and has snow depth data. Two other Quebec stations - Kuujjuaq and La Grande Riviere have snow depth but fall outside the anomalous area. A. Yes, the snow is really there, much thicker than usual. B. Melt out of winter snow pack occurs in late April or early May. Lots of accumulated snow in February-March does have a tendency to melt out a bit later, perhaps by a week (two at the very most). Note: it seems light April snows are much better at delaying melt-out than heavy March snows. Bottom line: we are not remotely close to the snow lasting through the summer, and I doubt that we ever will be. An ice age doesn't seem to be approaching. On the other hand, adding one week of snow cover during peak insolation season does count for some albedo effect. I don't think it's significant enough to affect the melting season, especially as the nearby Baffin bay is a peripheral area, downstream of the main arctic basin in terms of currents. I suspect that in Siberia things might be a bit different as the ESS is much more important than Baffin, but I'm not sure if I can bring myself to build the same database for some station(s) along that shore. If anyone is aware of a website that offers direct downloads of historical snow depth data for specific meteorological stations, please post links. Charts are snow depth in cm, for Goose Bay (station 71816), vs. day of year (negative days are of the previous calendar year). For what it's worth, I've sent two e-mails to CCIN, one to the mail address on the Contact us page, and one directly to Dr Julie Friddell. No answer as of yet. I regularly have a look at some of your graphs (also displayed on this website) and noticed how this year's trend lines on the Snow water equivalent graphs are extremely high for the time of year. I wanted to make sure the data behind the graphs is processed correctly before using the graphs in any of my writing. Do you know if this is so, or if not, give me the mail address of the person who does? I was in La Grand Riviere in the first week(s) of May in 2006 or 2007. No snow even in permanently shaded nooks, probably because it was T-shirt weather. Same conditions at Goose Bay in May of 2005. If I get up in those regions again I'll try to pay more attention. Secondary max impending in a few weeks? Eurasia SWE rising while North America has stabilized... North America should increase quite a bit this week. It's now March 21, week 11 AFAIK. Rutgers still posts only week 9 as the latest. So I think they really update this chart of NH snow cover only once per month. The first shows snow depth departures from average in the Northern Hemisphere. You will observe that for most of the Canadian Barrens and the Russian Tundra the snow is around 10 to 20 cms deeper than usual. It will melt a bit later but it will melt out by early summer. The second (very hard to read) is an extract of the map showing snow depth in the Eastern N. America including Quebec Province. You will see that apart from the coastal fringes most snow depth is bound by the 25, 50 and 75 cm snow depth contours. Surly it won't last the summer. I do not believe a few hundred gigatons of additional snow spread over a good many million km2 of Northern Canada and Russia is a preview of the next ice age. However, what I am convinced it will mean is flows of the great Northern Rivers that flow north into the Arctic Ocean will greatly increase, dumping loads of carbon rich soils into shallow seas, and through providing additional and longer insulation during the winter accelerate degradation of land-based permafrost. There is evidence of this (have a root around in the permafrost thread). That's a pity. A month is a long time in the Arctic ! The lower reaches of Greenland melt 5 feet of ice a year. At 12 inches of snow for an inch of water. That works out to 60 feet of snowfall. Less than that will melt out more than that will not. So will we get 60 feet of snowfall with open water in the Arctic basin each year? After the first ice free arctic, the winter will be horrible. The atmosphere will be soup relative to the historical levels of the holocene, but the arctic night is a formidable negative forcing. I don't see how temperatures won't drop below freezing, specially after the oceans released all the albedo heat. It might not get cold enough to get much sea ice, but it's going to snow like it never has during the holocene. I don't know if 60 deep over the whole hemisphere for many months, but it's going to be huge. But after a few iterations of ice free arctics, snow should be a rare thing. What I see happening is this. Ice free. big wind. lots of waves. All the fresh water run off mixed in with salt water to the point that it sinks to the abysmal depths. This pulls the gulfstream through the CAA and around the west side of Greenland. Is 60 feet of lake effect snow doable? Edit: Minus 10c not freezing. Open water gets + 20C warmer forcing. Right on the edge of freezing over. "What I see happening is this." The Atlantic waters have their own inherent inertia, it'll carry them east once they get far north enough, as now. They may split some % going due east to 'green up' Spain and North Africa, the rest accelerated north by the prodigious evaporation taking place in the arctic, driving an enhanced saline current out at depth. That in turn will develop its own inertia. 60ft of snow? possible where/when the north winds are persitent and forced to climb, my guess around Alberta/Montana, Lake Balkash and to a lesser extent Quebec and south to the great lakes. There'll also be an enhanced flow through the CAA of fresher surface waters escaping the arctic instead of being held by the coarse inverted topography beneath the ice. I suspect we'll see rapid erosion taking place similar to that which has begun in Svalbard, reshaping the islands when it begins to rain there on a persistent basis. I am curious to see how this year unfolds relative to others in late spring. I think if we fail to see appreciable delay in melt, it shows that we need to go well beyond current warming to precipitate enough snowfall that ^ does occur. Very interesting to see results as we push deeper into what has traditionally been the warm season...! Would also like to see Newfoundland or others if you can dig up? It seems at least for the moment, the gap vs normal continues to widen in the areas already mentioned. Terribly sorry to disappoint. Here is a location in the bluish area in east Siberia. Sredne-Kolymsk (Russia), station 25206, Lat 67, Lon 153. It shows the same behavior, much higher snow resulting in no delay in melt-out date. This theory of a new ice age doesn't hold water (pun intended). I'll grant you this caveat: at least at these levels of snowfall. If/when we get to 10x historical levels, we should check again. But if possible until then, let's cool down (pun intended) the tall words regarding the effect of higher land snow on arctic sea ice, the weather in general, and impending glaciation. It's just not happening. More snow, same spring date, not very interesting. I'll grant you this as well: pick another synop station with snow depth data going back 10-20 years, from this map here, and I'll try to generate a similar chart for that station. oren, first of all, compliments for your fine work on snow thickness in the Arctic. It shows the same behavior, much higher snow resulting in no delay in melt-out date. This theory of a new ice age doesn't hold water (pun intended). This does make perfect physical sense : water content of snow is typically something like 1/3rd or so. So even with a meter of snow, it translates only to 30 cm of ice. That will melt out quite rapidly, compared to Arctic sea ice which is about 1.5 m even for FYI. Add to that the fact that snow in the Northern Hemisphere falls on trees and other 'irregular' surfaces, which causes rapid melt once it gets started, and it makes perfect sense that snow depth is not a good predictor for timing of melt-out. The 3.3 million km2 of the Canadian Barrens is treeless and at a maximum elevation of 300 metres. The Russian Tundra of even more km2 is also treeless and mostly flat as a pancake. Although I also have no belief in a looming ice age, it would be nice to have useable data for these very high latitudes. You are right that the highest latitude lands are treeless and thus it's harder for snow there to melt out. But overall Northern Hemisphere snow cover is now 45 million km2, so these barren lands are just a small fraction of snow covered land. But surface properties is just a side-show. The point I was trying to make is that for snow melt, temperature is much more important than snow depth. Once air temps are above 0 C, snow melts rapidly. It takes ages to process but I finally completed one of these. I think it should lay your argument to rest. Seriously. Take a look at 2003, where 2 meters of snow seem to have disappeared in two days, Apr 25th-27th. Compare to 2002 where half the snow lasted 2 more weeks. I'm linking to the 2003 data so you can see the weather around that time. Temps rose to 11 degC max the day before. And that was before a lot of global warming in the past 15 years. Bottom line: thick snow does not create its own climate (at least in Canada), and does not last longer on the ground when the warm spring comes. I still think we are heading for a background state where 2003 will soon be irrelevant. But I do think your evidence is compelling in showing that high totals are still vulnerable to melt. Led by another uptick in North America while Eurasia has stalled. North American maxes seem to follow Eurasia's so it may be that we see a continued uptick in NAmerican SWE through early April while Eurasia plateaus/peaks by 4/1? While we are finally entering the time of year where melt can begin to occur over regions like Quebec, it is also when they open up to moisture. The lead pack generation this year is a substantial buffer in this regard in that large parts of the region can sustain 24 hours+ of 50F+ temperatures while retaining snowpack and then rebuilding on the back-end. I expect volatility will increase substantially over the next few weeks but volume may prove surprisingly resilient. Could the modeling change? Yes. But if this is correct, will it worsen as we head into May and the Bering's situation goes from catastrophic to ice-free entirely, with Chuchki and Beaufort in hot pursuit? I think that is quite possible. And if the ridiculously resilient pattern can manage to maintain/worsen as the hemispheric heat engine kicks into high gear as the summer equinox approaches, we may see crazier weather than ever before. Thanks for those graphs Oren and I appreciate your diligence. However I do wonder about the snow depth figures. I have often seen spurious snow depth figures appear on Ogimet from time to time. It automatically takes them from the synop codes but what if the synops had gone awry ? It does happen. On the morning of 24/04 at 12 UTC there was 288 cm. They day had some rain and some sun and maxed at 11.2 C and depths decreased by 15cm leaving a depth of 273 cm on the morning of 25/04 at 12 UTC. That seems pretty understandable (ie a 15cm drop). Then the big jump occurs. It goes from 273cm at 12 UTC to just 75cm at 18 UTC. There was sunshine during the day but the max of 10.8 C was slightly down on the previous day. Yet there was a drop of almost 200cm. That's about the height of a standard door ! Niall, I was wondering about that myself. I contented myself with checking the data in terms of consistency - it's high in all preceding days, and low in all following days. The physics don't make much sense, but I'm pretty sure there was a lot of snow one week, and gone the next, though I doubt if one day describes it properly. Perhaps there was some drifting or uneven melting. As the goal of my "research" was to correlate max snow thickness with snow melt-out dates (really in order to debunk a certain theory...), the specific dynamics didn't matter that much, it was more of an anecdote serving to highlight the result. It does get difficult trying to link snow depths with Arctic Sea Ice. The way I look at it, it is as a buffer zone, tempering the heat advecting northwards. The high albedo associated with snow ensures surface temperatures remain colder for longer and nights can still be very cold as spring advances. Last year, I see a good example over the far north of Eurasia. Persistent snow cover and a synoptic weather pattern that helped maintain the snow cover, produced a very cold May/Jun period over the far north of Europe. (Copernicus EU monthly surface anomalies attached). The snow line remained considerably further south than in 2016. The GIF attached contrasts the snow cover for the two years 2016 and 2017 for May 16th. What effect did this cold anomaly have on ice cover in the seas further north (namely Barents & Kara) ? For atmospheric melt the effect will be considerable because there will be a large temperature difference between air advecting north over a snowy surface then over one without snow. Of course atmospheric melt is only half the picture as melt will still be on going from the ocean underneath and the cooler northern atmosphere would only have a small effect on cooling the ocean SSTs. So here is what NSDIC reported in their monthly report for June 2017. "Sea ice was especially slow to retreat in the Atlantic sector of the Arctic .....The ice edge expanded in the Barents and Greenland Seas until the end of May, when the ice finally started to retreat ". In July 2017 "Through the first week of July, extent closely tracked 2012 levels. The rate of decline then slowed, so that as of July 17, extent was 169,000 square kilometers above 2012 for the same date . The spatial pattern of ice extent differs from 2012, with less ice in the Chukchi and East Siberian Seas in 2017, but more in the Beaufort, Kara, and Barents Seas and in Baffin Bay ." Given the very low state of ice following winter 16/17, I wonder how much effect the north Eurasian cold & snow cover had in preventing a quick melt out of the Barents and Kara last May/June.